Airline food hardly has a reputation for the finest of cuisines. But the next time you're upset with your airline meal, be thankful you're not the disheartened passenger who ended up with this container of vegetables. According to the NY Post, the traveler, who flew with Aegean Airlines, had selected the "Vegetarian Oriental" meal option ahead of his flight. Two passengers were denied boarding because they were wearing leggings in March. According to United, the airline had a right to deny boarding based on dress code because the girls were using “buddy passes” and were, therefore, representing the airline when they fly, similar to employees. Definitely not an employee, David Dao was forcibly removed from a United flight in April after he refused to give up his seat on an "overbooked flight," resulting in a serious concussion, a broken nose, and two lost teeth. Video of the incident went viral, causing United to change their policy and get slapped with a lawsuit that was quickly settled. United also faced another controversy when a giant rabbit being transported on one of its planes died in the cargo during a flight. According to The Sun newspaper, the animal, named Simon, was the son of the world’s largest rabbit -- a four-foot long continental rabbit called Darius --and was expected to have grown larger than his father. “Something very strange has happened and I want to know what. I’ve sent rabbits all around the world and nothing like this has happened before," said owner Annette Edwards. A bride and groom traveling to Costa Rica for their wedding in April were escorted off a United Airlines flight after they noticed a man sleeping in their seats and decided to move up three rows as to not wake the passenger. However, it was an "Economy Plus" seat and although the passengers said they complied to return to the seats, a U.S. Marshal removed them. American Airlines suspended a flight attendant while investigating a scuffle between him, a mom and two babies. In a viral video, a woman is seen hysterically crying while holding a toddler, with a male flight attending yanking away the stroller for her second child.g a scuffle between him, a mom and two babies. In a viral video, a woman is seen hysterically crying while holding a toddler, with a male flight attending yanking away the stroller for her second child. At the end of April, a man was removed from a Delta flight after he used the bathroom while the plane awaited takeoff on the tarmac. Early May, a Southern California family said they were kicked off an overbooked Delta flight because they refused to give up a seat they had bought for their young son sitting in a car seat. They were asked to have their son sit on their lap for the duration of the flight. They refused, saying they paid for the seat, to which the airline staff threatened the family with jail time. In May, Fort Lauderdale/Hollywood International Airport descended into total chaos after nine Spirit Airlines flights were canceled, leaving hundreds of passengers stranded and increasingly irate in the terminal. The cancellations were the result of a legal dispute between the budget airline and the Air Line Pilots Association International. According to CBC News, a 15-year-old boy was "trapped" overnight in an airport alone when Air Canada rebooked him on another flight after he missed his original one. However, the flight was almost 24 hours later and the airline did not offer him any accommodation or vouchers for food. Because he is a minor, he could not get a hotel room, he says. Also in May, a passenger claimed she was forced to pee in a cup aboard a United flight after flight attendants told her she wasn’t allowed to use the lavatory until the pilot had turned off the fasten seatbelt sign. The woman, who had an overactive bladder, was told the flight attendant would be filing a report about the incident. 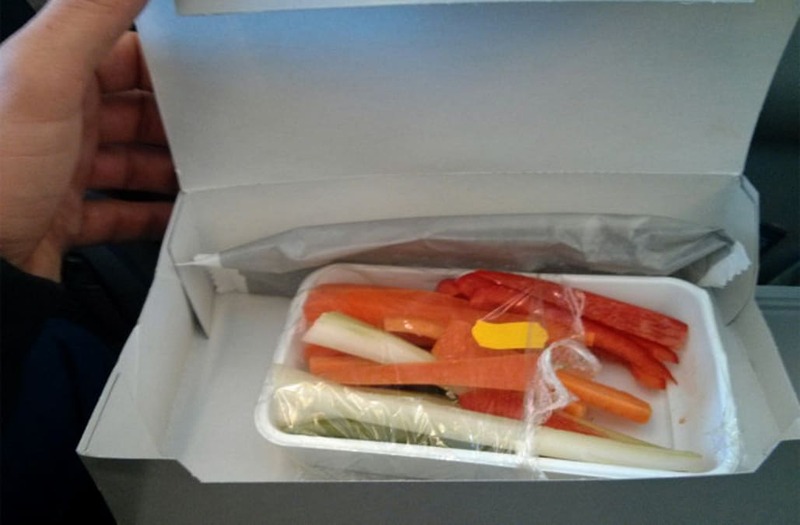 A photo of the offering, which the Greek airline described as a "vegetarian food prepared Chinese style," was posted on Reddit by user Musterknabe, who wrote alongside the image: "I booked my flight online and chose the 'Vegetarian Oriental' meal. This is what I got." While a fellow Redditor commented that calling the dish "oriental" seemed misleading, to which Musterknabe contended that the "oriental part was the Chinese celery." He went further to say that he wasn't even upset with the dish. That is until he realized passengers who order a non-vegetarian meal had been given an extra treat. Musterknabe said: "I didn't complain about this yummy dish. But then I realized that all passengers who ordered a non-vegetarian meal got an extra cookie for dessert, so I demanded a cookie and got one." He added: "I am not a vegetarian, I just prefer good meat." "I have to know where it comes from, how the animals were treated and what they got to eat — when I don't know it, I order a vegetarian dish." Stavroula Saloutsi, public relations director for Aegean Airlines, later told Express that the meal provided to the traveler may not have even been the correct one. "At a first glance, we may note that this meal must have been our vegetarian raw meal," Saloutsi said, "which is a combination of raw fruit and vegetables." "Therefore, it seems that it is not a vegetarian Oriental meal, which most likely our customer desired to have."